Left to right:: Brig. Gen. Carl Schaefer, 412th Test Wing commander, presents an Airman Leadership School graduation certificate to Cpl. 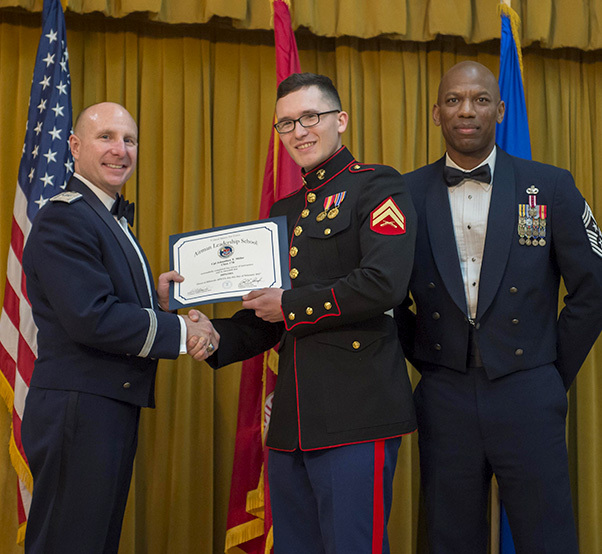 Johnathan Miller, U.S. Marine Corps VMX-22, along with Chief Master Sgt. Todd Simmons, 412th TW command chief. 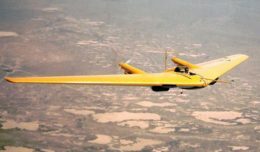 Miller also won the John L. Levitow Award for ALS Class 17B, which graduated Feb. 9, 2017. The Levitow award is presented to the student that demonstrated the most outstanding leadership and scholastic qualities. The 412th Force Support Squadron’s Airman Leadership School graduated 41 senior airmen, one U.S. Marine corporal and one civilian Feb. 9 at Club Muroc, Edwards Air Force Base, Calif.
Class 17B marks another class to graduate after ALS expanded its class size to accommodate Air National Guard and Reserve Airmen and offering slots to sister services and civilians. Graduates of Airman Leadership School Class 17B sing the Air Force song Feb. 9, 2017, at Club Muroc, Edwards Air Force Base, Calif.
ALS is a five-week United States Air Force program designed to develop Airmen into effective frontline supervisors. 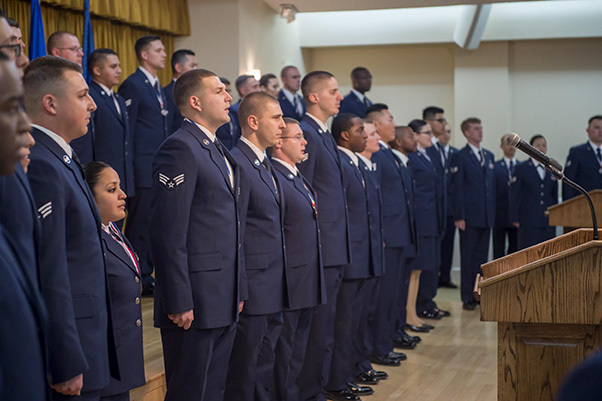 It is the first professional military education that enlisted Air Force members encounter. ALS focuses on building leadership and team development abilities as well as effective communication. Congratulations to all the graduates who took another step in their careers!